Although neither heaven nor hell exist on this earth some marriages are so painful that some people imagine them to constitute "Hell on Earth." be the source of one's greatest joy in life or their heaviest burden. To a significant degree, the difference depends upon who you choose as your life long spouse. Ironically the choice of who to marry is often made by relatively immature people, who are strongly influenced by emotions and hormones, rather than reason and reflection. Many of the problems in existing marriages are the direct result of a dating process that was inadequate, unfocused and faulty. Consequently, hope for successful marriages is found in an intentional approach to dating. Using the Bible as a guide, dating is assessed and evaluated. Suggestions are offered to provoke thought about the process of dating, the purpose of dating and the practices of dating. Assumptions about dating are challenged. The assumption is that the Creator knows His creatures better than anyone. God has provided specific instructions and principles to understand the marriage relationship. There are not specific biblical instructions about dating. But, understanding the role of dating, as it relates to what the Bible teaches about marriage, will enable an approach to dating that is clearly based on the teachings of the Bible. To facilitate use in youth groups or Sunday School classes, study questions have been included in an appendix. If you are already married it is likely that this book will provide clarity and encouragement to be the spouse you should be. When it was first published in 1999, this book was part of my continuing effort to educate my children in the things of the Lord. I was compelled to put into writing many of the concepts that I tried to teach them throughout their developmental years. By putting these things in print it was my hope that they would have a ready resource for years to come. I have sought to present God as the authority, recognizing that my children ultimately belong to Him and are accountable to Him. At the same time, I have shared numerous personal experiences and observations. Hopefully others may be able to profit from this work as well. 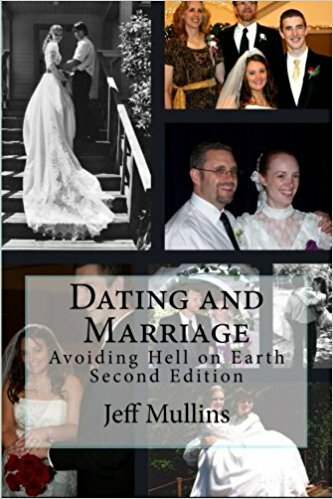 Please consider this book as one father's attempt to teach his own children about dating and marriage with the hope that they will avoid some of the many heart aches so many people experience. The 2nd edition has been updated and extensively revised based on another decade of life experience and increased insight into God's Word. Some of the material has be reorganized. Three completely new chapters have been added: 1) Attraction, Modesty and Flirting, 2) How to find a mate, and 3) The Wedding. YOUR FREE COPY OF A BIBLICAL DISCIPLE! Discipleship is at the Heart of the Church. Each Christian is a disciple and should be making other disciples. This book is intended to jump start the process of disciple making. The lessons explore important matters such as defining faith, salvation, the goal of salvation, spiritual growth, the importance of Church involvement, and more. A Biblical Disciple is designed to be used either as a self study guide, a one on one discipleship tool, or as a text for a group study. This is a book that carefully evaluates the role of parents in the lives of their children. In this volume the author raises and answers questions about parenting that are often over looked. All children are given parents, but why? Many species bear young they are completely capable of surviving on their own, but not people. What is the primary function of parents in the life of the child. The task of parents is raising children, but exactly what does that mean? And when, if ever is that task accomplished? Identifying the purpose, goal and motives of parenting are essential to being effective as a parent. The author carefully addresses each of these areas provoking the reader to think about and evaluate the answers to these questions. The book also addresses the practical issues of parenting such as discipline, education and stages of parenting.